"The custom products decapping tool is the simplest tool yet devised and is decidely faster than using a punch and base set. 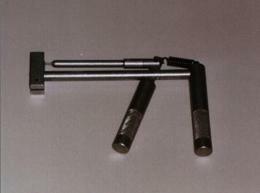 The shellholder is reversible to take either a .378" or .473" case head. They also come in many other sizes (PPC, mags, etc.) upon request. The mandrels are also available in all calibers."